This luxury Seacoast Penthouse, constructed in 2012, is located just steps from downtown Portsmouth, a City recognized for its harborside location, vibrant economy and contemporary amenities. The elegant three-bedroom Penthouse, Unit 501, has expansive views of Portsmouth Proper and North Mill Pond. 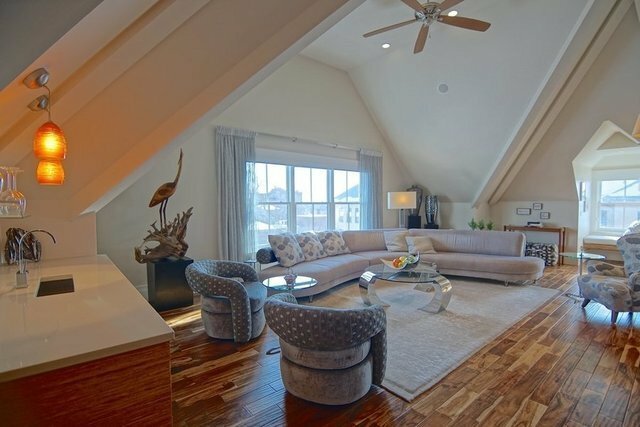 Savor the spectacular view of the North Church steeple and Portsmouth's historic "Memorial Bridge" from the windows framing the northwest wall of the spacious living room. The bedrooms and den on the west side of the Unit provide additional views of the City's North Mill Pond and West End. Within the Penthouse you will find rich hand-scraped Acacia wood floors flowing from room to room throughout the Unit. The designer kitchen, and the adjacent wet bar, boast custom bamboo cabinetry, quartz countertops, and outstanding high-end appliances such as the Sub-Zero refrigerator, Miele Dishwasher and Wolf range and oven, complete with a warming drawer. Each of the three en-suite bedrooms provide custom built-in closets and Cityscapes all their own, with two of the bedrooms including private balconies. The master suite offers a large walk-in closet with a discreet separate exit, an elegant bath containing Carrera marble on the counters, floors and double master shower, and a raised soaking tub over-looking North Mill Pond. Embrace the solitude of the master suite's private sitting area, relaxing beside the natural stone fireplace. The warm and sophisticated layout of this Penthouse is designed for contemporary living. This is truly a breath-taking home where, in just a short 5 minute walk, you will find Portsmouth's dynamic downtown, offering fine dining, upscale shopping, and a lively music, theatre and art district. The Unit is deeded with on-site storage and parking for 3 vehicles, a rarity in downtown Portsmouth.